IciciBank Is Running Awesome Offer For Theri Users Where You Can Do Atleast 1 Recharge, Pay Bill Or Send Money You Will Get Rs. 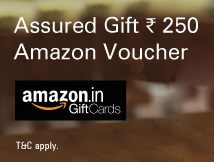 250 Amazon Voucher For Free. Hurry !! Grab This Offer Now ! Just login to your ICICI Bank iMobile app or ICICI Bank Internet Banking from a desktop, laptop or mobile (m.icicibank.com is our mobile browser), pay at least 1 bill, recharge your prepaid devices and send money to your loved ones and get an assured Amazon gift voucher worth Rs. 250! What’s more? The top 30 users with the highest number of transactions for the month will each get a JBL Bluetooth speaker free! This offer is valid till October 31, 2017. So start now! Login to your Internet Banking Account with your User ID and Password from your desktop/ laptop/ mobile. Login to iMobile with your MPIN. To download iMobile on your mobile phone, just SMS iMobile to 5676766 or give a missed call to 09222299998. Finish your transaction and get your Amazon Promo Code via SMS within 30 days. If you are amongst the top 30 Users who have done the maximum number of transactions in the month, you will win a JBL Bluetooth speaker! The winners list will be published 30 days after offer expiry. The speakers will be delivered to your registered address 7 days after the winners list is published. Bank on the go and enjoy this great deal! Offer valid from July 6, 2017 to October 31, 2017.